War of 1812 Artifacts Archaeological excavations conducted by Timmins Martelle Heritage Consultants Inc. (TMHC) uncovered a small number of artifacts from the War of 1812. These included a musket ball, two buck shot and a caltrop. Click here to see image examples. 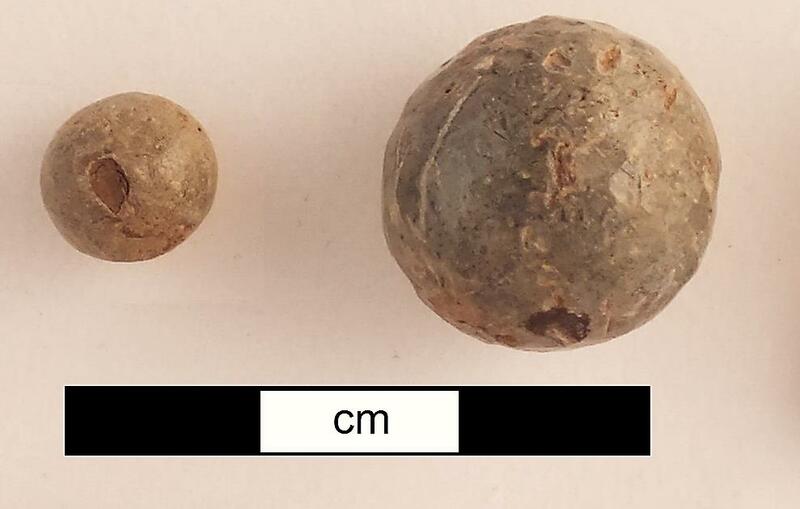 ?The musket ball measured between 16.5 mm (0.65 inch) and 17.0 mm (0.67 inch) in diameter, and both buck shot measured in the double naught size range, that is, between 8.4 mm (0.33 inch) and 8.9 mm (0.35 inch) in diameter. These sizes were consistent with the buck and ball load American troops employed during the War of 1812. Buck and ball was a paper cartridge containing one musket ball and two or three buck shot. The purpose was to increase the chance of hitting a target with the bonus possibility of hitting multiple targets with one shot. The smaller buck shot might not kill a target but could cause enough injury to remove a soldier from battle. 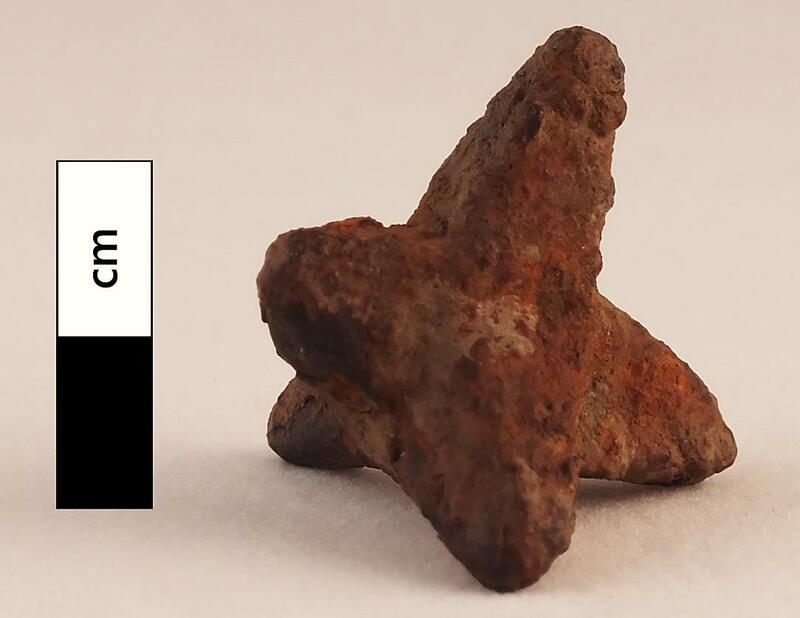 A caltrop (also known as a crow’s foot) was an iron, non-explosive, anti-personnel device that always had a spike pointed up when tossed on the ground, causing injury to the horse or person who stepped on it. The purpose of caltrops was to slow down pursuing troops. Caltrops typically had four points, while the one collected by TMHC had five points. It is also quite small, with a maximum length of 34 mm (1.34 inches). The caltrop is a unique find; so far it is the only known War of 1812 caltrop. Caltrop found during excavations by TMHC. The only other known caltrops found archaeologically were discovered at Jamestown, Virginia. In this case, the 17th-century colonists used caltrops as a defense and warning system against surprise attacks. I just have a question regarding where the caltrop was found? You have stated where the one not relating to the War of 1812 was found, but I would like to know the location of the discovery of the 5 point caltrop related to the War of 1812. 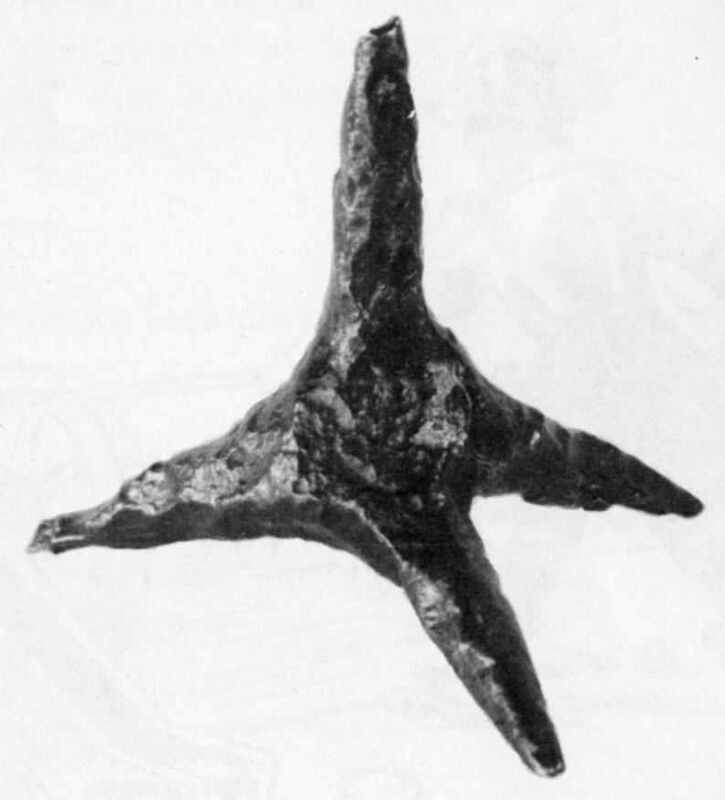 The caltrop was found during archaeological excavations at Tecumseh Park, Chatham, Ontario. The archaeology was done in advance of park improvements. After a crushing naval defeat, British troops were retreating eastward along the Thames River in the fall of 1813. Chief Tecumseh, a British ally, opposed the retreat but was assured the British would take a stand against the Americans at this location. However, when Tecumseh arrived here with his people there was no one. With the Americans in pursuit, Tecumseh decided to stay and fight in an attempt to slow the American advance. An hours-long skirmish between Tecumseh’s forces and American troops took place in the park named after the Chief. Tecumseh, too, was forced to retreat, and was killed the next day, 5 October 1813, during the Battle of the Thames.